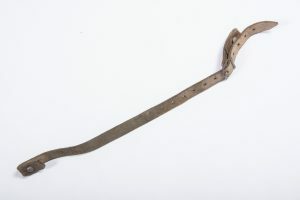 Nice late war chinstrap in unblackened leather marked 0/0560/0156. 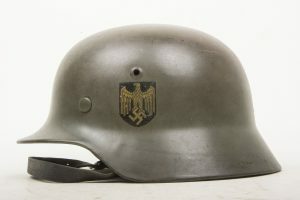 Finishing touch to any late war helmet! Rare 1943 dated reinforced aluminum liner size 58, the last year that the reinforced liner was made. 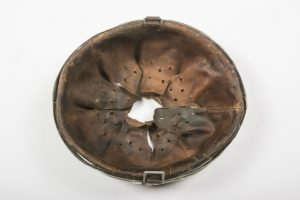 Rare liner for a size 66 helmet shell in size 58. 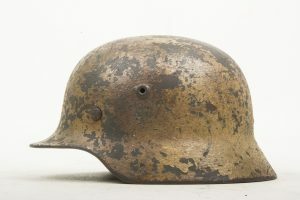 A one looker original three-tone sawdust camouflage helmet in very good, used condition. 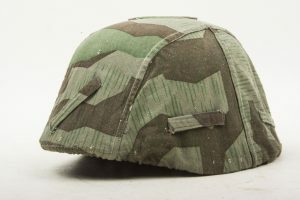 The helmet retains up to 90% of its original sawdust camouflage paint. 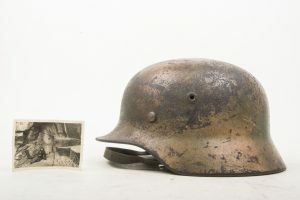 The helmet retains its original liner in size 56. The helmet is a nice example of a sawdust camouflage helmet with good strong colours! 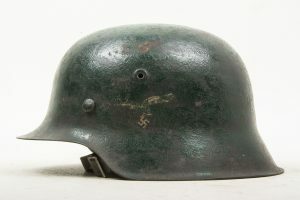 A typical reissue M35 helmet that has been reconditioned during the war. The helmet retains its original double layer Rautarn finish up to 99%. 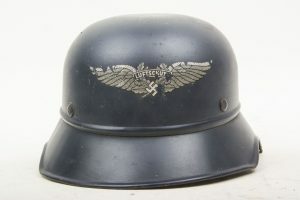 The helmet is marked ET60 indicating production by Eisenhüttenwerke, Thale and has a reinforced, 1938 dated size 53 liner. Size 60 helmets are twice as rare as size 68 helmets. They are a great display next to a huge helmet showing the variety in sizes. Possibly one of the nicest reissued helmets I’ve seen with a very nice rough finish! 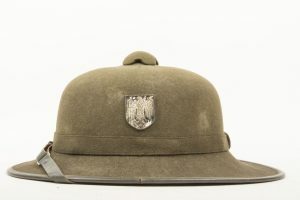 A nice second pattern Afrikakorps pith helmet in unissued condition. 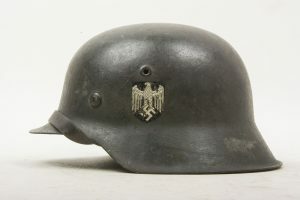 The helmet is dated 1942 and is size 56. 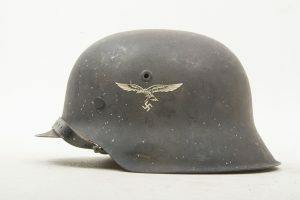 The helmet is complete with its chinstrap and its zinc insignia. 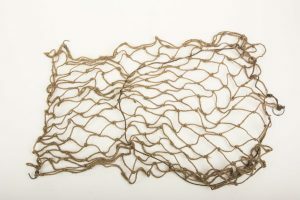 Mid war German helmet net made of rough, brown string. 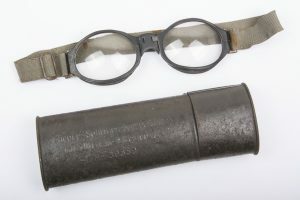 Unlike the late war variant this mid war type is hard to find! 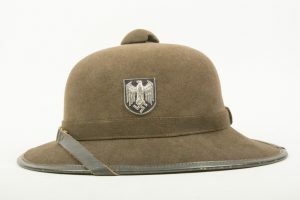 The helmet net would easily compliment any German army helmet. 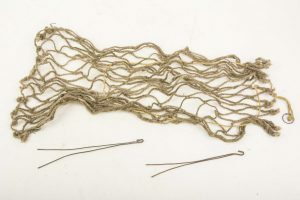 This early type of camouflage net is very hard to find! 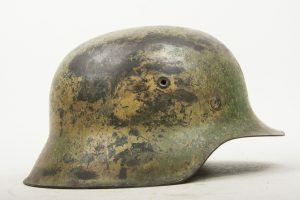 A very nice late war multi coloured German helmet net. 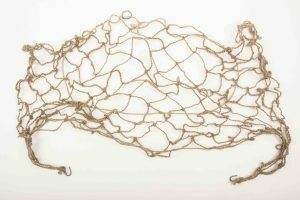 The net is in mint unissued condition and comes with a fine pair of net wire hooks to attach the het to the helmet. 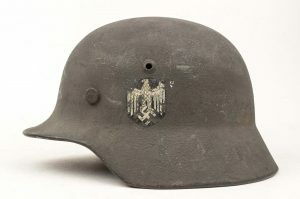 A very nice attribute to any late war Heer or Luftwaffe helmet! 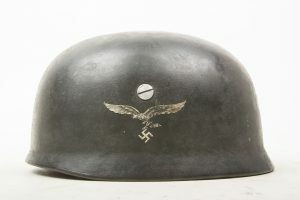 A hard to find mid war German helmet net in mint condition. 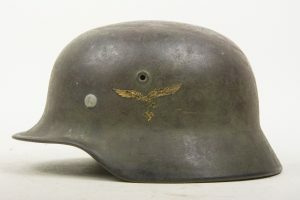 Not to be confused with the late war helmet nets with the open ends. 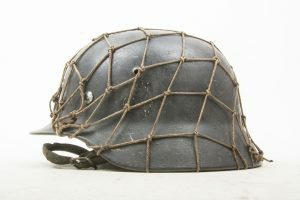 Hard to find mid war helmet net with all the original hardware. Can’t be upgraded!